At the European Para Championships in Italian city of Lignano the Team’s event is concluded. In Women’s Class1-3 Croatia’s Andjela MUZINIC and Helena KARIC won gold. Italy and Great Britain are second and third. In Class 6-8 France’s Thu KAMKASOMPHOU and Anne BARNEOUD are at the top followed by Sweden and Poland. In Class 9-10 Turkey’s Neslihan KAVAS, Umran ERTIS, Hilal TURKKAN and Merve Cansu DEMIR overcame Russia. France and Netherlands clinched bronze. In Class 11 Krystyna SIEMIENIECKA, Dorota NOWACKA and Monika DOBKO emerged at the top of the Group for Poland. Russia and France are second and third. In Men’s Class 1 Robert and Paul DAVIES of Great Britain concluded the competition at the top of their Group. Germany and Italy are second and third. 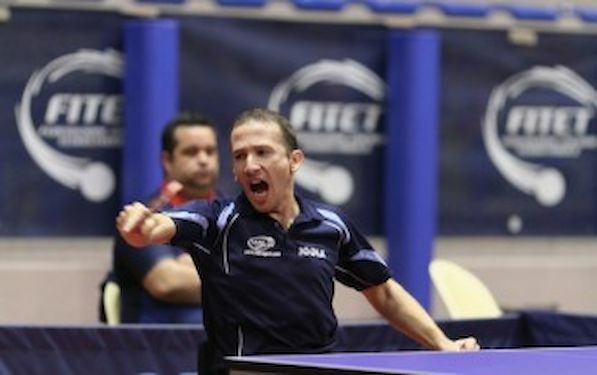 In Class 2 Stephane MOLLIENS, Fabien LAMIRAULT and BOURY Vincent of France beat Slovakia to secure the title. Austria and Serbia are third. In Class 3 Germany’s Thomas SCHMIDBERGER, Thomas BRÜCHLE and Jan GÜRTLER clinched the title. They overcame Austria in the final. In the semis they succeeded against Ukraine and Spain. In Class 4 Maxime THOMAS and Emeric MARTIN of France overcame Turkey at the final hurdle. Slovakia and Poland won bronze. In Class 5 Florian MERRIEN, Nicolas SAVANT AIRA and Gregory ROSEC of France succeeded against Serbia. Germany and Turkey are third. In Group 6 Germany’s Thomas RAU, Thomas KUSIAK and Tim LAUAE are first followed by Denmark and Croatia. In Class 7 Maxym NIKOLENKO and Mykhaylo POPOV of Ukraine beat Spian to win the gold. Bronze went to Germany and Great Britain. In Class 8 Belgium’s Marc LEDOUX and Mathieu LOICQ overcame Hungary in the final. Poland and Sweden are third. In Class 9 Ukraine’s Yuriy SHCHEPANSKYY and Vadym KUBOV succeeded to the top. Netherlands and Poland are second and third. In Class 10 Poland overcame Spain in the match for title. Patryk CHOJNOWSKI, Sebastian POWROZNIAK and Igor MISZTAL played for winning team. Russia and France are third. In Class 11 Zabit Kürşat ÇAĞLAYAN and Garip OLCAS of Turkey are the winners. Poland lost in the final and Russia and France in semis.